> Home > New Finds! The Invertebrate Zoology course this term (taught by Richard Emlet and Maya Watts) found some very interesting organisms that have only rarely, if ever, been seen in Oregon before! 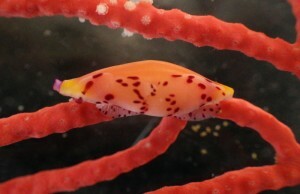 Bay Nature wrote this article about the Hopkins’ rose nudibranch (Okenia rosacea), a California native, which the class found at Sunset Bay. The class also found this cowrie snail, thought to be Simnia vidleri, in a dredge from Cape Arago. This snail has previously only been known South of Monterey Bay, making this find a surprising range expansion if it is indeed Simnia vidleri. A tissue sample has been sent off for DNA identification.